What do you do when your site has a large number of visitors but very few of them complete an order? With SEO optimization or Google Adwords campaigns you can bring visitors to your site. But to keep them loyal you need more. Email marketing is one of the most effective ways to do this. Most site visitors will not make a first-visit purchase. This process may take up to 30 days or more. If you do not remember your site, it is very likely that you will see product information about yourself and buy from the competition. That’s why we recommend using a newsletter with useful content to help your customers. Efficiently built, the newsletter will remind your customers of you, develop their trust in you and will cause them to act. Create a personalized newsletter that strengthens your brand in your client’s mind with the products you sell. A content and frequency strategy to make sure the newsletter is not considered spam. Consultancy in using email marketing tools such as Mailchimp so that you can send emails directly to your customers. Results tracking and complete reports through which you can see exactly the results and effectiveness of email marketing campaigns. For creating a newsletter, we typically use standard email templates (models) that have been reviewed and used in the past with good results. We customize them by tailoring them to your brand in a way that will make readers interested and take them to action. Through a newsletter, you will keep in touch with your existing clients and build a lasting relationship with them. We help you present new offers to help them make a new sales decision. Your first opinion counts. By design we will capture the attention of your customers and by content we will determine them to act. 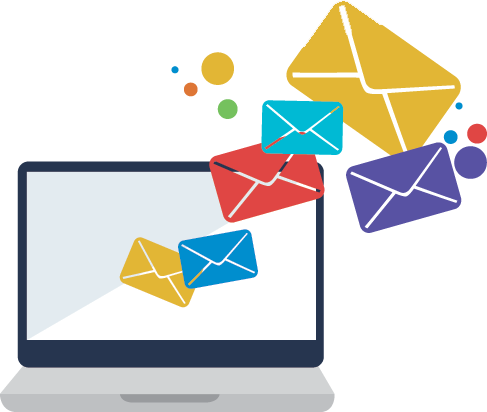 We help you create email lists so your messages are not considered spam. We offer easy-to-use templates to save time, create content, and provide technical support for all steps in an email marketing campaign. We help you reach your objectives and quickly develop your business in the online environment.